Home - How do you like your fireplace? How do you like your fireplace? With many of us worried about rising fuel costs for gas, oil and electricity and actively being encouraged by the Government to change energy suppliers to seek a cheaper tariff, what additional or alternative heating method would you choose to add to your home? Would it be a wind turbine, a ground energy source pump or an open fire? I, like many others have changed energy supplier, but for me the current debate is whether to add an open fire or a wood/multifuel burning stove to my room. 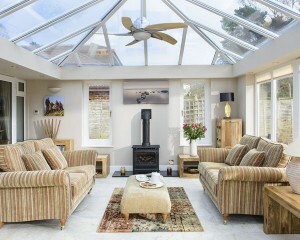 This wood burning stove looks lovely in an Anglian Orangery and will offer extra heat on chilly days. I grew up in a home with coal fired central heating and an open fireplace in the lounge. The fire was lit during the Winter on very cold days to give added heat and warmth to the home, and also offered an alternative cooking and heating method when we had power cuts. Over time the ability to heat our homes has improved with the introduction of energy saving products and ground breaking technology that has changed the way our roofs and walls are manufactured for our homes. We all like to feel the warmth from a fire, whether it is open or enclosed. It adds an ambiance to a room; the fire place gives a room a focal point, something to look at and in some instances can offer an alternative heating and cooking facility when the power goes off. Have you considered having a fireplace or stove installed? Here is what we thought you would need to consider. – Does the energy output of the stove suit the size of the room you are planning to heat? 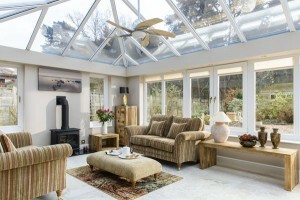 – Do you have an existing chimney that can be used/adapted or do you need to have one installed? – Check the required height of a new chimney/flue to a property. Homes built before WW1 and WW2 will have different building specifications for the chimneys on the property, so ensure that your chimney is capable of being used. – Is the room suitably ventilated to remove smoke and toxic gasses, ensuring everyone’s safety? – If you are using an existing chimney, ensure that it is swept regularly to prevent a chimney fire and adhere to the Clean Air act of 1993. – Who will carry out the installation? Do you need the help of a professional? In our experience this is not a job for a novice and we would recommend seeking a reputable company/professional to carry out the installation to ensure that all the necessary tests are carried out. – What is your budget for the installation? With many regulations to follow regarding the installation, materials used, location on a wall, height of a chimney/flue, be sure that you do your homework before asking anyone to embark on the installation. For more information go to the Planning Portal which will offer you guidance. How lovely it is to huddle around a fire on chilly days with family and friends enjoying the cosy feel it brings to your home. 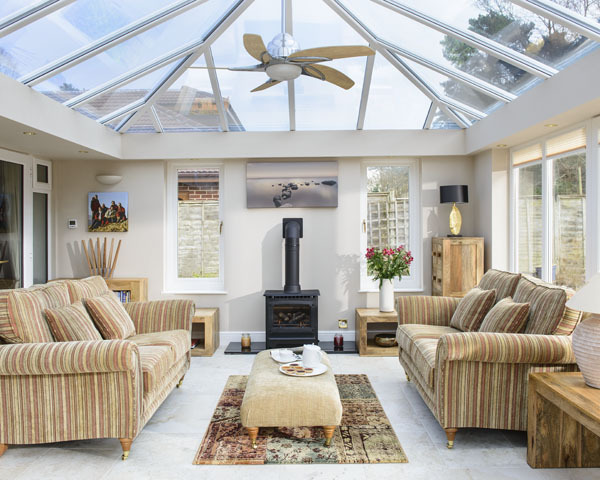 We are sure which ever you choose to install, whether it is an open fire or a stove you will enjoy the warmth as it radiates around your home.